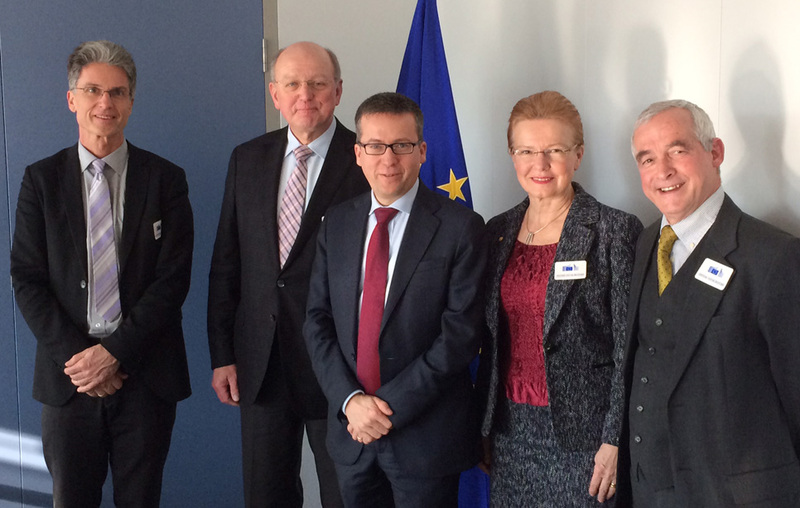 The Presidents representing the principal European associations of Universities of Science and Technology, CESAER, CLUSTER, EuroTech Universities Alliance, IDEA League and Nordic Five Tech, were pleased to meet with Commissioner Carlos Moedas on Friday 13 February. The meeting focused on the contribution of Universities of Science and Technology to the EU priorities in support of excellent research and innovation. Given his own background with a degree in civil engineering, Commissioner Moedas highlighted the important role of Universities of Science and Technology in boosting innovation and raising the uptake of close to the market activities, including through their innovative models of doctoral training. The Universities of Science and Technology emphasized their unique position and capability to connect industry and other societal stakeholders within their local, regional and national eco-systems, as well as connecting EU innovation hubs. They urged the Commission to ensure simplification across its research and innovation instruments. Topics of common interest and concern discussed during the meeting also included the Commission’s proposal for the European Fund for Strategic Investments, research infrastructures, next steps in completing the European Research Area and International Cooperation in research. The meeting was attended by Karel Luyben, Rector Magnificus of Delft University of Technology; Karin Markides, President of Chalmers University of Technology; Jan Mengelers, President of Eindhoven University of Technology; and Aarnout Brombacher, Vice-Rector International Relations of Eindhoven University of Technology.